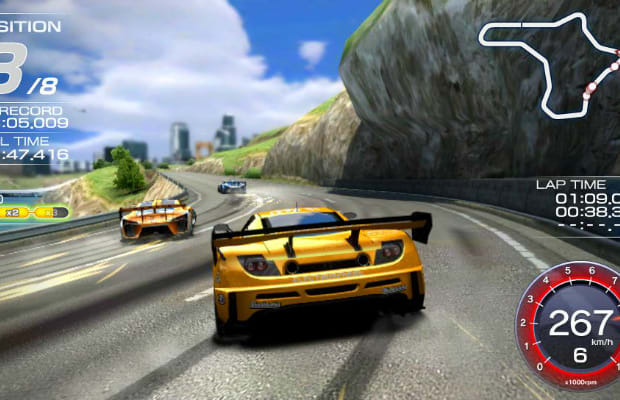 For 16 years, Namco has been compliant with the game industry law that every console or handheld launch must be accompanied by a Ridge Racer game. Even if it feels like the publisher cranks these games out in its sleep, they do come out with a noteworthy gem once in a while. Their first Vita game, simply titled Ridge Racer, is promising in both its familiar controls and displaying some of the best lighting effects the Vita's launch line up has to offer. While I didn't delve too deeply into the car customization feature, their new "Machine Upgrade Map" can certainly make the real-time online play interesting, especially when you can also tune your style of drifting. The fact that you can have as many as eight cars in a track for multiplayer gives it one of the higher player counts among the Vita’s launch games. If you and your friends can't get your schedules in sync, there's also the option of playing against your friends' ghost cars.